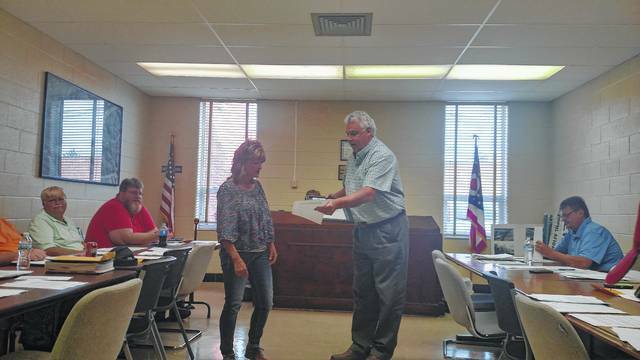 New Boston Village Council issued a resolution Tuesday night recognizing Peggy Kindinger for her success as a marathon runner, who has ran marathons in all seven continents of the world. The Village congratulated Kindinger for accomplishments and stated that she was inspiration to all those in the community. Mayor William Williams also asked council to consider sick leave sharing. Sick leave sharing allows Village employees to share some of their sick time with fellow co-workers who have already used all of their allotted time off but are presented with a situation that would require them to take leave from work. Williams explained that several employees were interested in being able to give some of their sick time to another employee; however, the Village did not have a policy for doing so. “I did not feel I had the authority to grant or deny the request without a policy in place,” Williams stated. “Anytime an employee would want to step up and help another employee in this situation, I would be totally in favor of it. We just need to establish guidelines,” Councilman Dan Fetty stated. Council agreed to move forward with the development of policy for sick time sharing, which will be added to the Council agenda for the next meeting. Williams also asked Council to consider the hiring of a handicapped or disabled individual who would work three to four hours a week assisting with shredding documents. Williams explained that the difficulty would be that the individual would be hired as a part-time employee and would have costs associated with doing so, including the paying into worker’s compensations. Village Solicitor Justin Blume explained that he knows some individuals have been hired under the program to shred documents for judges at the Common Pleas Court. He was able to confirm that Domestic Relations Court Judge Jerry Buckler currently employees an individual who does the shredding for his office. Council voted to approve the item for the next Council agenda. Williams also informed Council that he has heard several concerns over the increased sewer rates coming from the City of Portsmouth. The Village of New Boston entered into a 30 year contract with the City of Portsmouth in 1991 for Portsmouth to treat all of New Boston’s sewage and for all of New Boston’s sewage to be transported to the Portsmouth treatment plant. Thus, New Boston utility users are included in the Portsmouth rate increase. Williams explained that the contract with Portsmouth will not be up until 2021 and only stipulates as far as rates that Portsmouth can not charge the Village residents more than the City residents, which is not happening. He added that the only way he can see to get out of that agreement would be for the Village to have their own treatment plant. Williams explained that the Village will be working with the EPA and revisiting to contract in order to consider options. However, they are seeing little other options. He also encouraged Council to consider any options they can come up with. New Boston Village Council meets at 6:30 p.m. on the first and third Tuesdays of each month at the New Boston Community Center.